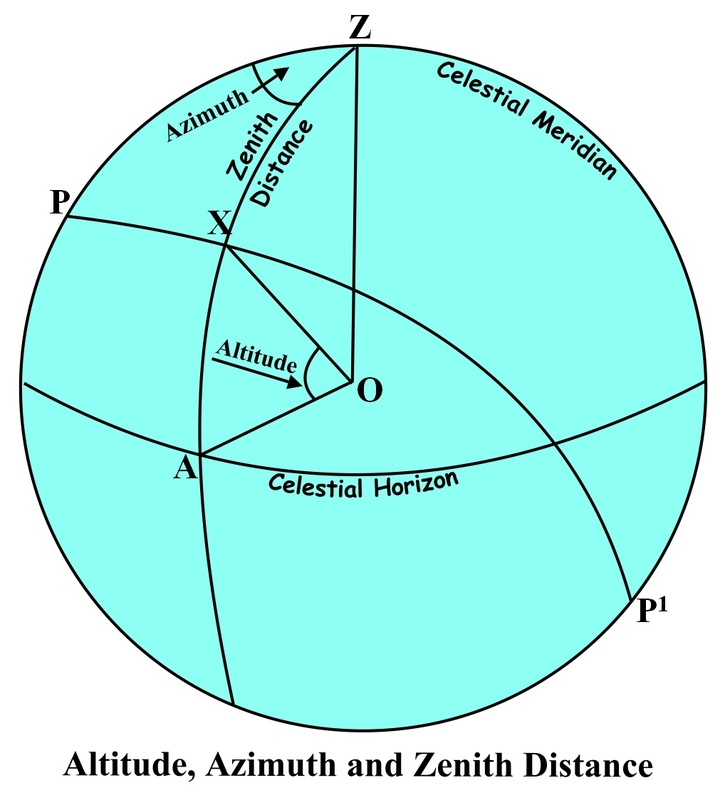 The Role Of Altitude, Azimuth And Zenith Distance In Astro Navigation. Point Z represents the zenith of the observer’s position. Point X represents the position of the celestial body and this point, if projected onto the Earth’s surface, would correspond to the Geographical position of the body. P and P1 are the north and south poles respectively. The Zenith Distance. The zenith distance is the angular distance ZX that is subtended by the angle XOZ and is measured along the vertical circle that passes through the celestial body. Relationship Between Zenith Distance And The Nautical Mile. An angle of 1 minute at the earth’s centre will subtend an arc of length 1 n.m on the earth’s surface. Therefore if the angle XOZ is 30o (the arc ZX) will be equal to 30 x 60 = 1800 arc minutes at the earth’s surface and so the zenith distance will be equal to 1800 nautical miles. The Altitude. Altitude is the angle AOX, that is the angle from the celestial horizon to the celestial body and is measured along the same vertical circle as the zenith distance. Azimuth. The angle PZX is the azimuth of the celestial body and is the angular distance between the observer’s celestial meridian and the direction of the position of the body. The Role Of Altitude, Azimuth And Zenith Distance In Astro Navigation. It can be seen that by measuring the altitude of a celestial body, we are able to easily calculate the zenith distance which will give us the distance in nautical miles from the observer’s position to the geographical position of the body. The azimuth will give us the direction of the GP from the observer’s position. This explains why measuring the altitude and azimuth are the first steps in determining our position in astro navigation. (A thorough treatment of this topic can be found in the book Astro Navigation Demystified).